The first clue that there was maybe something amiss with the case against Amanda Knox and Raffaele Sollecito came from stories I'd heard about what can be, at times, one of the most merciless groups around - high school kids. In the wake of Amanda Knox's acquittal last Friday of the murder of her former roommate Meredith Kercher in November 2007 in Perugia, Italy, critiques of Italy's justice system are inevitable. Had the system initially erred because it relied on a false confession, a dodgy witnesses, or flawed forensics? Probably yes to all those failings, but when 48 Hours sent me to Perugia to cover the story, I learned something pretty basic was being ignored - common sense. In early December 2007, my 48 Hours colleagues in Italy, Sabina Castelfranco and Giulia Alagna, had found several students in Perugia who had known both Knox and Kercher. Surely, we thought, if Knox cold-bloodedly slashed her roommate's throat, as alleged, there must have been some serious and obvious trouble brewing between the two. Also, if "mean girls" tales from high school were any guide, then Amanda Knox would likely have gone behind Kercher's back and complained about her British roommate to whoever would listen; over and over and over again. However, we quickly learned, that didn't happen. The students we interviewed said Knox did not bad-mouth Kercher and often had kind things to say about her roommate. How, we wondered, could that be? Now a bit skeptical, on February 8, 2008, we met Knox lead prosecutor Giuliano Mignini at the Kefe Bar in Perugia for a drink -- apertivo -- and, hopefully, insight. Mignini told us there was no cause for our confusion. He assured us that he had a key witness who could prove the three people in custody (Knox, Raffaele Sollecito, and Rudy Guede) had killed Meredith Kercher in the late hours of November 1, 2007 and then fled the scene together. The witness, Mignini explained, was an elderly woman who lived near the house Knox shared with Kercher. The witness described a terrifying scream in the night she'd heard coming from the house. Then she claimed to have heard - not seen - three people running away from the crime scene. Mignini said he was completely convinced that the witness's account of hearing exactly three people running was the proof he needed to show that Knox, Sollecito and Guede were the killers. But we asked ourselves, how could anyone "hear" exactly three people running? Sure, you can hear multiple footsteps, but to say exactly three, made no sense. So we next turned to forensic science and on Valentine's Day 2008, we went to the sprawling headquarters of Italy's Scientific Police in Rome. Some of the hallways are lined with photos of mafia dons, drug kingpins, and infamous killers. And to our surprise, there, among the framed images on this walk of shame, was a photo of Amanda Knox. Even though Knox would not be formally indicted for murder for another eight months, Italian police had, at least figuratively, nailed her trophy to the wall. Eduardo Giobbi, part of the top echelon of the Scientific Police, told us his agency - one steeped in fingerprints, DNA, and forensic methods - had not used scientific evidence to lead them to Amanda Knox for the murder of Meredith Kercher. Instead, Giobbi bragged, he and his fellow investigators had noted Knox's often quirky behavior and found a killer hiding behind her antics. Forensic science in the Knox case, it seemed, be damned, at least in the critical initial days. It became a sad and shocking truism. By the end of the many Kercher murder trials, Amanda Knox would usually be called a she-devil in open court. No one from the prosecution ever objected. In November 2008, Peter Popham of The Independent in England wrote that a fairly wacky blogger in Italy had an unhealthy influence on prosecutors in Perugia. The blogger was Gabriella Carlizzi. She was likely the first person to claim there were dark, satanic forces behind Meredith Kercher's murder. After all, the murder happened a day after Halloween. On November 7, 2008 we interviewed Gabriella Carlizzi in her well-appointed offices in Rome. She told us that much of the information she had about the satanic elements of the Kercher case came from a Catholic priest who she identified as Father Gabriel. That maniacal take on the case did not come by email, text, or telephone. Instead, it came in the form of revelations. It had to, as Carlizzi explained, since Father Gabriel had died in 1989. As I left, what can only be called, "the Carlizzi experience," I thought of The Wizard of Oz, Dorothy's movie-length nightmare and her words to her dog: "Toto, I have a feeling we're not in Kansas anymore." It took the Italian judicial system nearly eight years to wake from its Kercher murder nightmare. But it was no dream for either Amanda Knox or Raffaele Sollecito. They were arrested in 2007 and convicted of murdering Meredith Kercher in 2009. Each spent four years in prison before an appellate court acquitted them in October 2011. Then, a second appellate court re-convicted the two in 2014 and sentenced them to decades in prison. 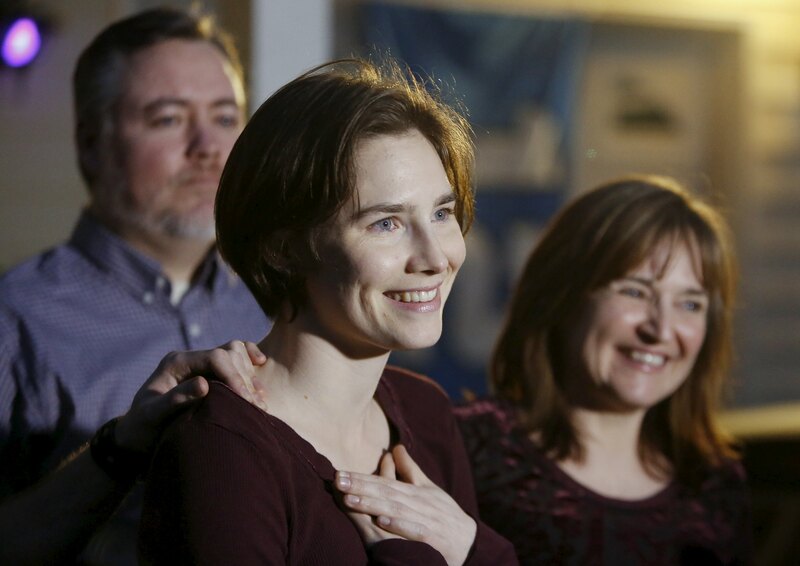 Friday's definitive ruling by the Italian Supreme Court, means, once and for all, Amanda Knox and Raffaele Sollecito are finally back in "Kansas".